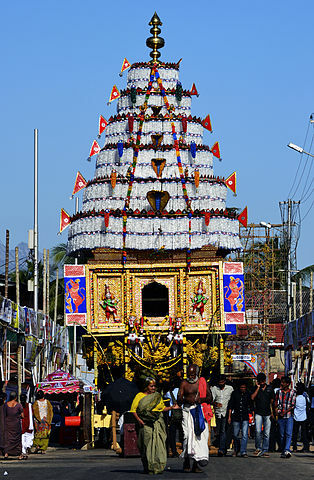 The festival of Kalpathi Ratholsavam is celebrated as the chariot festivals is staged at the Sree Viswanatha Swamy or Lord Siva temple which is attended by thousands from all across the region of South India and from the foreign soil as well.The festival is dedicated to the Lord Viswanatha or Shiva. The Kalpathi Ratholsavam is an annual extravaganza that reflects the fervor of Indian culture and a forum to enjoy the varsity in the Indian culture as well.This festival is celebrated in the month of November the District of Pallakad once in a year. The place of Kalpathi in Kerala is famed as Dakshin Kasi or the Varanasi of the South is the venue for the festival where the Sree Viswanatha Swamy temple us situated. 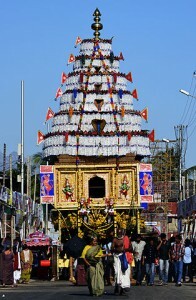 The temple is flanked by thousands of devotees who enjoy the Vedic recitals and cultural programs for the first four days. The rituals which are conducted is believed to be around 700 years old following the ancestral value which makes the festival more serene and faithful to the devotees. The last three days becomes more exciting when the chariots on the streets start rolling and thousands of people gather surrounding it to draw the decorated chariot and to be a part of the mega ceremony. The ceremonial procession is taken by a host of people who feels it a sacred ceremony and they feel proud to be a part of the event.